Over the course of the next two weeks, the Pac-12 Microsite will break down each team’s season: what went well, what didn’t, and a look ahead at the future. Today’s subject: Stanford. The Cardinal dominated its non-conference schedule, winning 15 of their 17 games outside of the Pac-12. It wasn’t the toughest non-conference schedule in the world, but Johnny Dawkins’ team did wind up with a pair of wins against NCAA Tournament teams (Colorado State and North Carolina State) prior to their conference slate, then ripped through a field of also-rans in the NIT in March. All told, the Cardinal displayed a pretty drastic improvement on the defensive end of the court, finishing in the top 20 nationally in Ken Pomeroy’s adjusted defensive efficiency numbers. And for a team that relied heavily on underclassmen (five different freshmen and sophomores played at least 40% of the team’s total minutes), there should still be plenty of room to improve, especially on the offensive end, in the near future. While all that youth should pay off next year, it was the undoing of the Cardinal during the conference season. After getting off to a 5-1 start in Pac-12 play, the Cardinal lost five of their next six and struggled mightily, especially on the offensive end. Between Martin Luther King Day and Valentine’s Day they scored just 0.92 points per possession, highlighted by sophomore Aaron Bright’s 22-of-70 shooting during that stretch, good for just a 37.9% eFG. On a squad that was a model of a team effort (11 different players averaged at least eight minutes per game, with six different players averaging somewhere between five points and 13 points per night), it is hard to pick out just one player, but the Cardinal were clearly a team whose fates aligned closely with Bright’s performance. He averaged four more points per game, one more assist and shot the ball nearly 20% better from behind the arc in wins than in losses. When Bright was going good, he was a tough defender, a confident floor general, and a deadly three-point shooter who made opposing defenses pay for collapsing in on interior players like senior Josh Owens. While there is something to be said for Owens’ 11.6 points, 5.8 rebounds and 57.1% field goal percentage (not to mention freshman Chasson Randle’s team-leading 13.8 points per game), Bright was really the most important player on this team, as evidenced by his near-perfect run through the NIT when he averaged 16.8 points, 4.2 assists and shot a whopping 79.5% eFG. Here it is, the only team locked into the NCAA Tournament no matter what happens this week in Los Angeles. With only eight losses and wins against Oregon and Washington on the road and Colorado at home, even a loss to or Stanford or Arizona State on Thursday wouldn’t knock them out of the Tournament. However, I could see them moving up to a nine seed (which is exactly like an eight) if they win two games at Staples and have teams in front of them (Long Beach State, Alabama, and Kansas State, to name a few) lose early on in their respective conference tournaments. 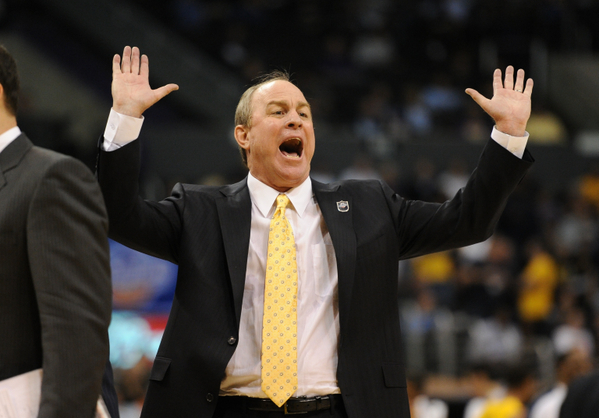 While we could see any team from Cal to UCLA win the Pac-12 Tournament, the Golden Bears are the definite favorite coming in. They’ve got a near-elite to elite player in Allen Crabbe, and with a supporting cast made up of Jorge Gutierrez, Justin Cobbs, and a sleeper player that I think will come alive this week, Emerson Murray, the Golden Bears have unrivaled depth in this conference. The Ducks remain on the outside looking in heading into the Tournament, but I’m of the belief that if they win two games and play in the Pac-12 Championship, regardless of what happens there, the Ducks will be included in the field of 68. Oregon has been on the bubble for the better part of conference play, but the real noise in Eugene began when it went down to the desert and took both games from the Arizona schools. Before that trip, Oregon was embarrassed by a 77-60 loss to California at home. Since then it has gone 11-3, with the biggest margin of defeat coming in a 76-71 loss at home against rival Oregon State. Besides Cal, the Ducks have the best chance to make a run in the Pac-12 Tournament; it’s almost like their team was built for it. To win any college basketball tournament, whether it is the Maui Invitational or NIT, you need to be able to shoot lights out, and two, have depth off the bench. As of late, the Ducks have been making everything they put up, and they put up a lot of shots. Watch for Devoe Joseph, E.J. Singler, and Garrett Sim to go off on any given night, considering all three are capable of creating and making their own shot. Look for junior forward Carlos Emory to have a big tournament coming off the bench. Pac-12 Burning Questions: Pick A Part? Each week through conference play, we’ll offer up a couple of different takes on the biggest question of the week in the Pac-12. 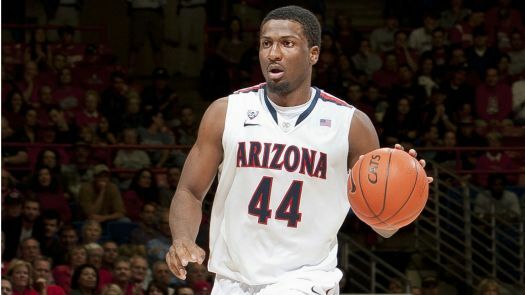 Andrew Murawa: Arizona’s lack of interior size is their biggest weakness. At present, they’re playing a seven-man rotation with only one player bigger than 6’7” – raw 6’9” freshman Angelo Chol – getting any serious time. Jesse Perry, a 6’7” senior best suited to a combo forward spot, is ostensibly the team’s starting center. Enter Washington’s 7’0” junior center Aziz N’Diaye, sliding right into the Wildcats center position, moving Perry to a move natural four-spot, Solomon Hill to the three, and sending freshman Nick Johnson to a sixth-man role. Not only would N’Diaye give Sean Miller a defensive stopper inside, he’s shown his ability to be a solid rebounder on both ends of the court. And, when the Wildcats want to get out and run, N’Diaye has the athleticism and the motor to keep up with their young backcourt. 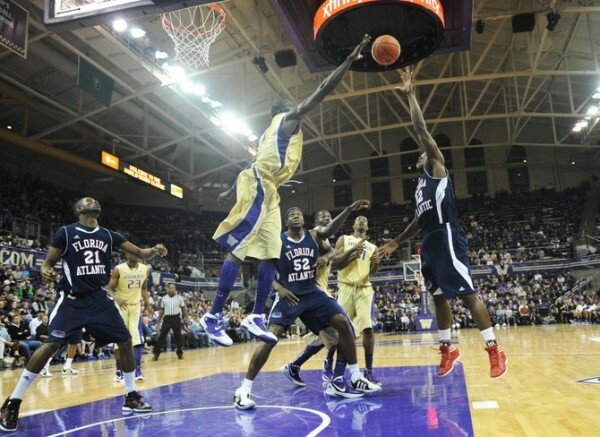 As they are now, the Wildcats are a solid but flawed team, scrapping along to keep in Pac-12 race. Magically drop N’Diaye onto that roster and they’re the favorite in the conference, even with inconsistent freshman Josiah Turner still growing into his role at the point. 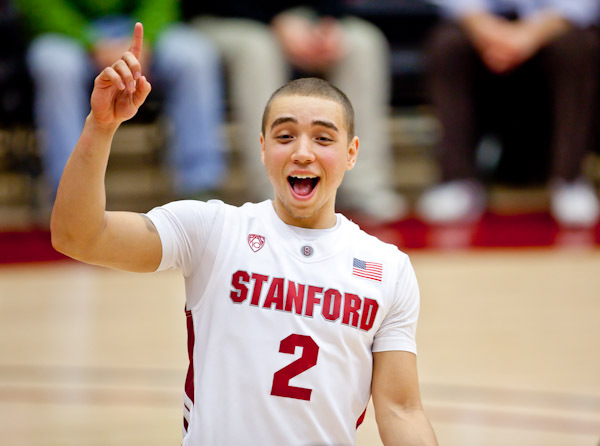 Last season, Stanford was a pretty bad basketball team. They had all kinds of trouble scoring, especially early in the season, and weren’t much to look at defensively either. And given that it was one of the least experienced teams in the country (with an average of 1.15 years of experience, good for 315th in the nation, according to Ken Pomeroy), that wasn’t really much of a surprise. The constant theme around the Cardinal program was that this team’s best days were in the future. Well, a year later, minus Jeremy Green, the team’s leading scorer in 2010-11 who gave up his final year of eligibility to chase an NBA dream (he, predictably, went undrafted), this team is a bit more experienced (1.53 years of experience now, up to 208th in the nation), and this team is unquestionably “good.” The question is, how good? There haven’t been a ton of chances in the non-conference for the Cardinal to really gauge themselves against a high-caliber opponent, but in their one game against an elite team, against Syracuse at Madison Square Garden in the NIT Season Tip-Off Championship, Johnny Dawkins’ club acquitted itself quite well, taking a seven-point lead against the Orange under five minutes to play before folding to the pressure of the Orange and the pressure of the situation. Sophomore point guard Aaron Bright broke onto the national scene in that game, scoring 13 points on five-of-nine shooting, grabbing four rebounds, handing out four assists and snatching one steal, while freshman guard Chasson Randle seemed comfortable in the spotlight and senior Josh Owens proved that he could hang with some of the big boys in the nation. And Dawkins continued his run of seemingly always finding a hot hand to help off the bench to chip in, this time in the person of little used sophomore forward John Gage, who tossed in a couple threes on his way to ten points in 12 minutes. But, down the stretch Stanford’s poise and defensive excellence faded. In the final five minutes, Bright missed both of his field goal attempts and turned the ball over once, Randle was one-of-three with a turnover and Owens missed the front-end of a one-and-one, turned the ball over once and failed to grab a rebound. In the meantime, Syracuse was able to score 18 points on its final ten possessions (1.8 PPP) after having only scored 51 in its first 60 (0.85 PPP). The question then is, which was the aberration? Was the real Stanford the team from the first 35 minutes that had a top-five national team on the ropes, or the team that was outscored by 13 points in the last five minutes? As usual, the truth probably lies somewhere in between. While the Cardinal have shown a defensive efficiency (86.2, ninth in the country) that will likely keep them in contention throughout the season, this is still a team that is inexperienced, and what experience they do have has not yet been a part of a successful team. In short, this team needs to learn how to win close games, and the process of playing in a tight game with an elite team, such as Syracuse, should help along the learning process. Mike Lemaire is an RTC correspondent. He filed this report from Sunday’s Stanford-NC State game. For the first 33 minutes of its game against North Carolina State, Stanford looked nothing like the team that just nine days earlier had led No. 5 Syracuse by six points with less than five minutes to play. The Cardinal committed cheap fouls, they let the Wolfpack take open jump shots, and they allowed CJ Leslie and Ricardo Howell to catch the ball deep in the post for easy baskets. Then, over the next four minutes, Johnny Dawkins’ team played with a renewed sense of urgency. They pressured the ball, fought through screens, were more physical on the low blocks and grabbed every rebound in sight. The result was a defensive effort that proved they are a legitimate contender for the Pac-12 crown. Aaron Bright And His Teammates Have Plenty of Reasons To Smile After Starting The Season 8-1. Entering Sunday’s game, the Cardinal was ranked eighth in the country in defensive efficiency. But with a little more than seven minutes left to play, NC State had opened up a 61-52 lead and Stanford’s defense was the primary guilty party. The Wolfpack shot 55.6% from the field in the first half to lead by four entering halftime, and Mark Gottfried’s team took advantage of Stanford’s flat start to the second half to increase the gap. But by the time the game clock read3:06, Stanford led 64-63 and they looked nothing like the same defense that had been on its heels four minutes earlier. They only forced two turnovers, but the Wolfpack had only mustered three free throws. The Cardinal never trailed again, finishing off a 76-72 win and posting perhaps the best non-conference win they will get all season long. Upset of the Night. UAB 64, Cincinnati 47. Hangover, anyone? Three days after playing the game of the year in the Crosstown Shootout against Xavier, Cincinnati travels to Alabama, shoots miserably, and falls 12 points short of their previous season low. No disrespect to the Blazers, though; they were responsible for more than their share of the Bearcats’ lackluster showing. UAB was obviously the fresher team, coming off of a 12-day stretch with no games, a time they used to improve themselves on the defensive side of things. UAB coach Mike Davis said afterward, “We knew how important it was for us to come out and really play with a lot of intensity on defense. It was the best performance we’ve had all season on defense.” The combination of fatigue (both mental and physical) and UAB defense forced UC into a 31.7% shooting night, including an atrocious 3-22 (13.6%) from behind the three-point arc. The Blazers weren’t exactly lacking on offense, either. Elijah Millsap was formidable, stepping up with 22 points and 15 boards, and Howard Crawford added 14/5. Dion Dixon, the Bearcats’ only player in double-figures (13/3), minimized the possiblity of a post-Xavier hangover when asked about it after the game, saying, “That didn’t have anything to do with it. We’re a young team, we haven’t played many games on the road.” Really? It’s true, not all of them are major contributors, but eight of UC’s 14 players are juniors or seniors. And five of their nine games this year have been away from their home floor. The most damning evidence that the Bearcats’ minds and bodies weren’t totally into this one, though, is that Cincy came in as the 10th best rebounding team in the nation, averaging 40.2 a game. 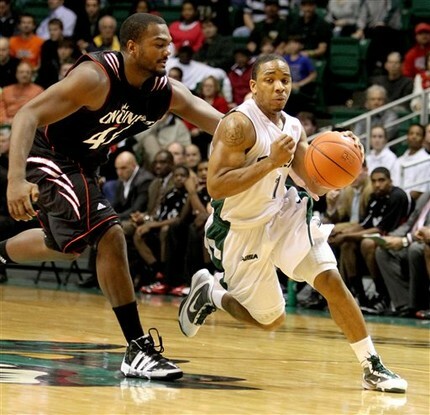 UAB ranks 179th (32.6 RPG). Tonight UAB owned the boards, 44 to 29. No doubt, Cincinnati will be back, but it was UAB, now 9-1, who served notice to the rest of the nation tonight. RTC Live. Oklahoma State 71, Stanford 70. RTC Live visited Maples Pavilion for the first time this evening, and although the fans weren’t all that excitable throughout the game, we were treated with a near-miraculous finish as Stanford hung around just long enough to have a shot in the air to win this one. It didn’t happen, as Andrew Zimmermann’s drive to the left and subsequent shot attempt went long and fell harmlessly off the glass into the hands of an OSU player, but for most of this game it appeared that the Cowboys were the far superior team, so the fact that Stanford was even in that position had to be a positive for Johnny Dawkins’ team. The two stars for the respective teams both had big nights — OSU’s James Anderson dropped 28/6/3 assts, including several very difficult three-point plays the old-fashioned way and a few deep threes the modern way in the second half. Stanford’s Landry Fields had 22/12/4 assts to keep the pace, and it was his playmaking down the stretch that led to open looks for Stanford to crawl back into the game. Dawkins has to be kicking himself a little bit, though, as the Cardinal committed 11 fewer fouls than Oklahoma State, shot thirteen more FTs, yet only earned four more points from the stripe — that’s what 12-24 will do to you. It was OSU’s second-half three-point shooting (6-12) that gave the Cowboys as much as a 15-pt lead, but Stanford’s Jeremy Green (19/7) stepped up with a few timely shots to keep his team within striking distance. We came away not very impressed with either team tonight, but clearly Oklahoma State should feel good about itself in getting a road win, even one against a Pac-10 team with half the fans not in the building tonight.